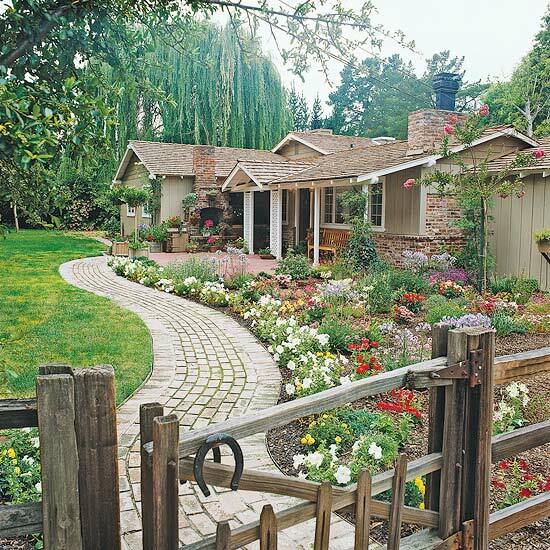 A gently winding path is the perfect entrance into this front yard. Flanked by a colorful bed of blooming annuals, it looks great all through the seasons. Planters brighten up a chimney near the front door, and a wide terrace creates a perfect spot for entertaining. A picket fence surrounds this dooryard and makes a great backdrop for a summer show of red and yellow roses and a variety of perennials. 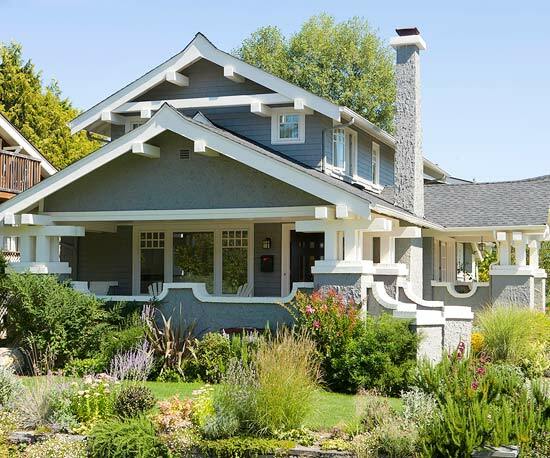 The cottage-style planting is repeated along the foundation. 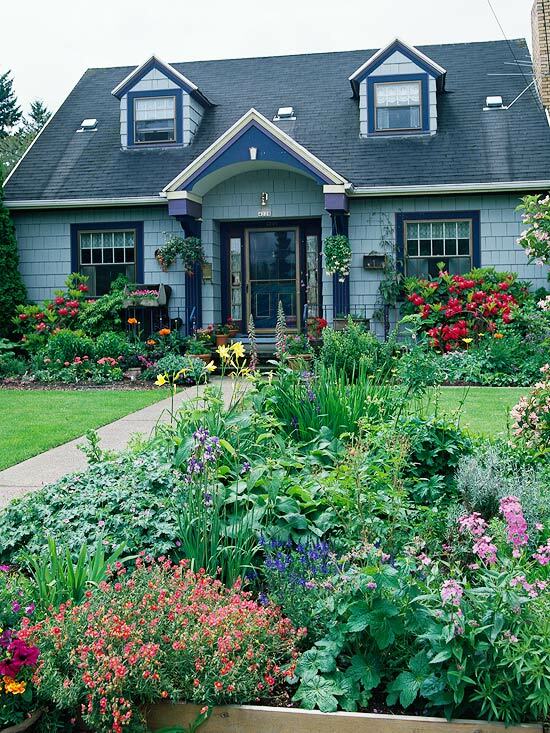 Blooms planted in a cottage garden right beside the sidewalk allow passersby to enjoy the flowers up close. 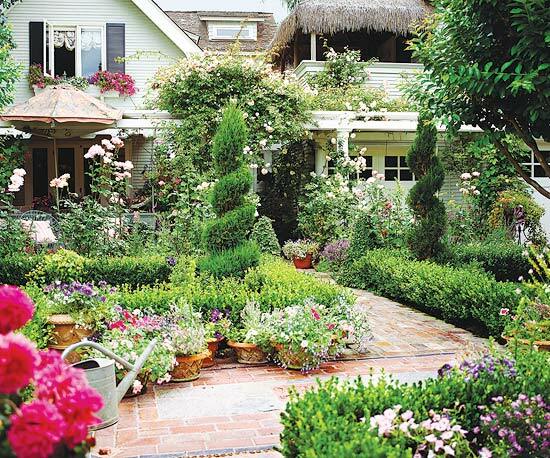 Tuck fragrant plants, such as roses, lilies, and herbs, along walkways for extra sensory appeal. 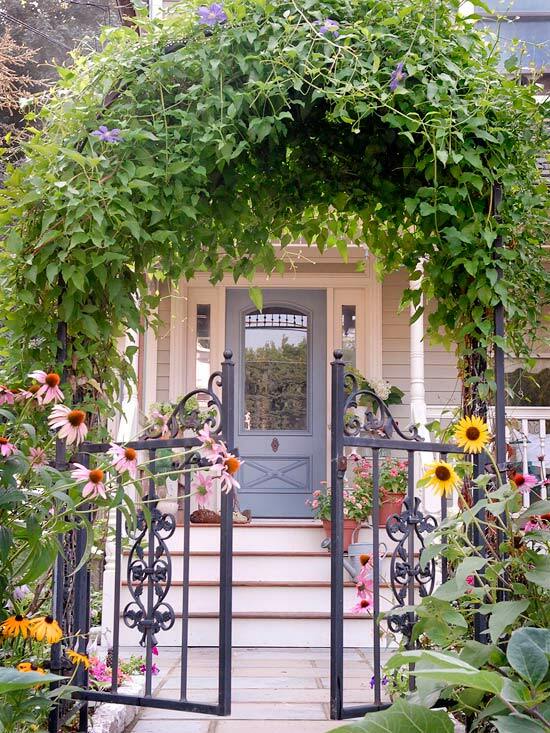 Take advantage of a porch by framing it with flowers. 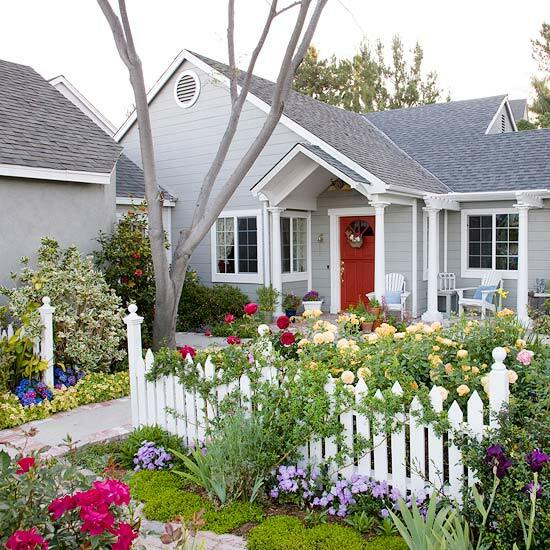 A few pockets of bright-color blooms help this tiny front yard hold lots of interest without feeling cramped. Enhance a rustic or Arts and Crafts home with a rugged walkway of pavers broken up by pockets of low-growing groundcover, such as this sweet alyssum. 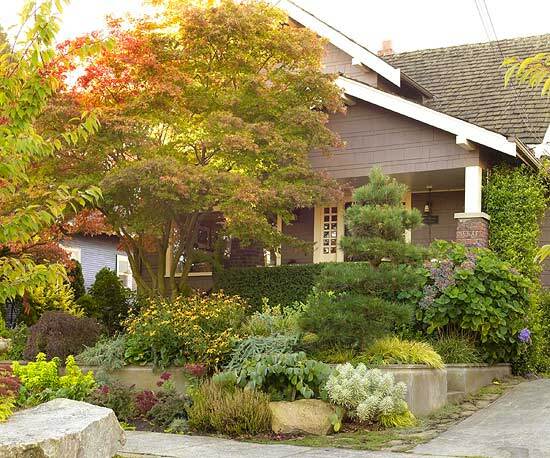 Lush plantings on both sides of the path help prevent this small-space front yard from feeling too tiny. Don't be afraid of color. 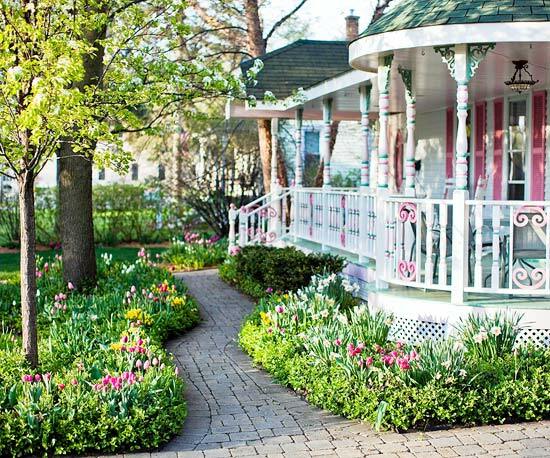 Here, a riot of shades gives this yard a romantic, cottage feel. Climbing roses on the pergola over the front door perfume the air, and a clipped boxwood hedge along the path gives the yard a sense of boundary. 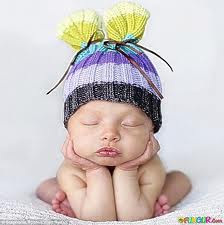 Here's another example of using color effectively. 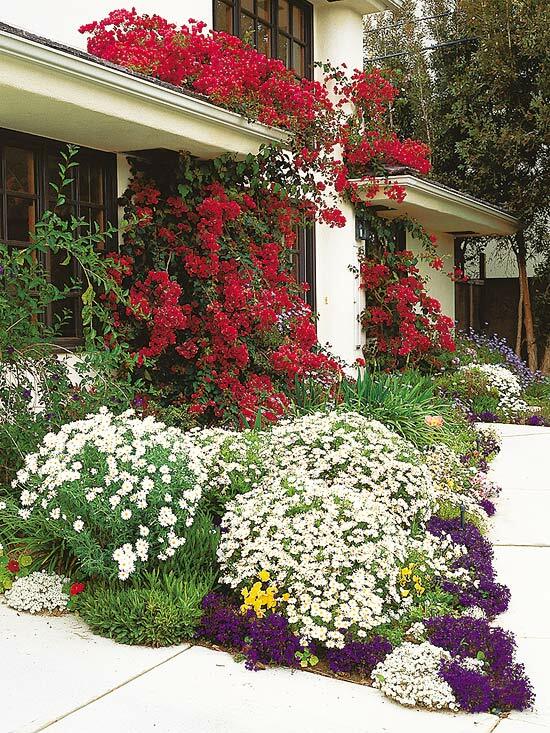 Bright red bougainvilleas clothe the front porch, while white marguerite daisies and blue lobelia playfully cloak the front walk. Yellow pansies add a bit of extra sparkle. Create an impact each spring with bulbs, cool-season flowers (such as pansies), and spring-flowering trees and shrubs (such as this redbud). As the bulbs fade, later-blooming perennials will take center stage. 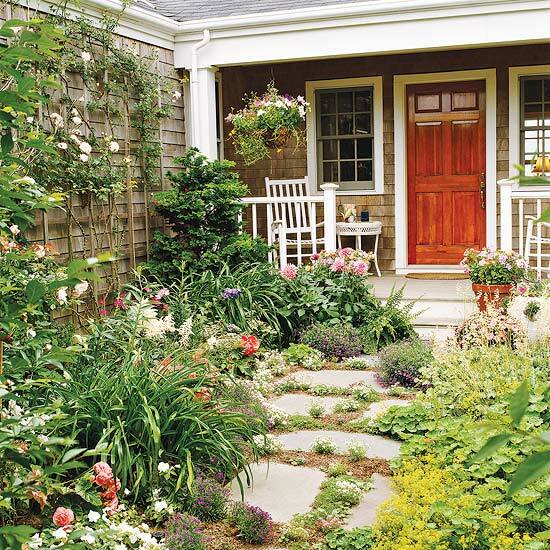 Accent them with summer-flowering annuals. Repeat pockets of color to draw your eye down a path as you walk. Here, beautiful blue lobelia is joined by a riot of other early-blooming plants. 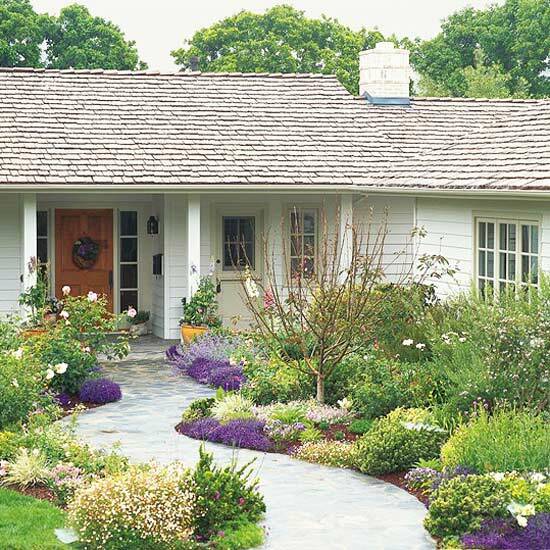 Spikes of Russian sage, sedum, and ornamental grasses among other perennials and shrubs add texture and color to an otherwise-dull gray-and-white house. 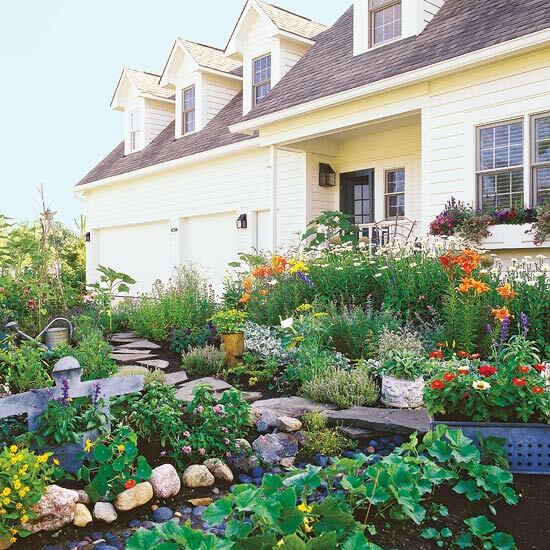 This flower-filled front yard incorporates lots of herbs and vegetables -- so harvesting fresh, home-grown produce is a breeze. Planting flowers with your vegetables helps attract pollinators for extra yields. 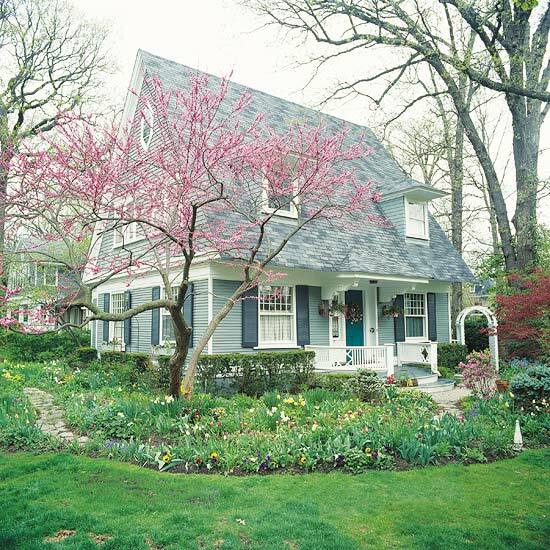 A bright yellow house is a perfect foil for a colorful mix of blooms. 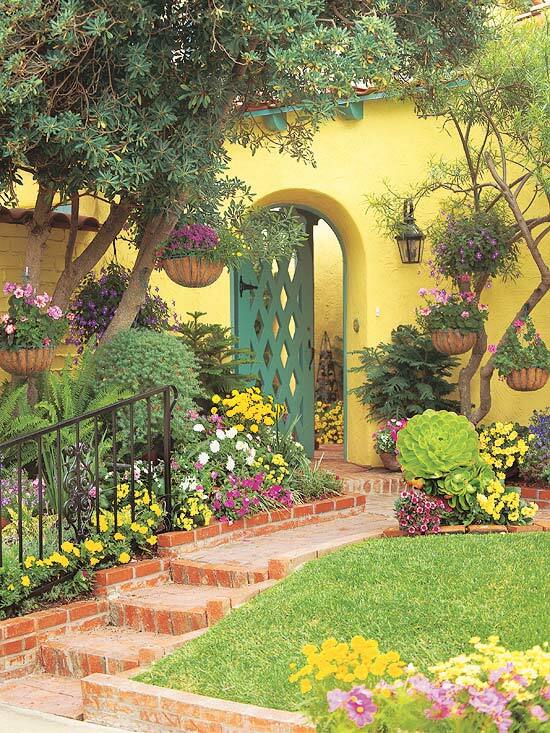 The bright stucco wall, brick walkway, and colorful blooms combine beautifully to enhance a Spanish theme. Clematis on the arbor offers a striking entryway. The towering arch creates a tunnel, offering the illusion that the yard is much larger than it actually is. Bright containers against the house help draw you in. 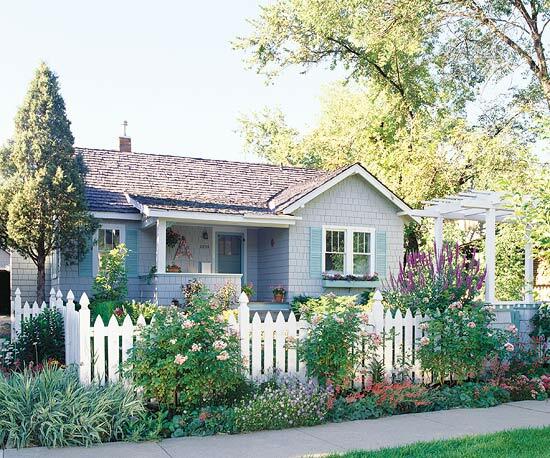 A street-side bed adds a pocket of color and breaks up a large expanse of front lawn, creating lots of interest in just a small amount of space. Create a sense of privacy and illusion by planting some taller specimens near your sidewalk. Airy plants will create a screen that allows visitors to peek through without having a wide-open view. Wow! It's a beautiful surrounding i really love this very much!